Home » On Its Fifth Anniversary, Let’s Celebrate and #DefendDACA! I cautiously celebrate this milestone as I recognize DACA’s success, while grappling with the concern about its possible rescission and what that could mean to so many people in this country. Since DACA’s implementation in 2012, over 800, 000 people have benefited from it, getting a chance to work with authorization, along with a reprieve from the threat of deportation. Although its benefits are granted only for a renewable period of two years, many people took a chance on the program, putting their faith in the same government that had failed to deliver on immigration reform and continued to separate families. DACA was not the ultimate goal or desired solution, but it was a welcome reprieve for so many undocumented people who yearned to move ahead and provide for themselves, their families, and the country they call home. While I was a Board of Immigration Appeals (BIA)–accredited representative at Asian Americans Advancing Justice–L.A., I had the privilege of assisting DACA applicants and their families and got to learn about the life-changing opportunities that having deferred action brought them. I witnessed families sacrifice their savings so their child could apply. I felt the determination of applicants who continued their GED classes while working full time. I saw their hope that all these investments would be worthwhile. Now, working as a summer law clerk at NILC, I continue to see the resilience of this population and their allies. The mental, emotional, and financial investments in DACA proved worthwhile for Naomi (not her actual name). As a high school senior, she was set to graduate several months before she and her parents decided to move forward with her DACA application. She had been accepted to several schools and had received a scholarship to attend a small liberal arts college. However, to make good on its offer, the college needed her to provide a valid Social Security number. After she got DACA, Naomi could show her valid work permit and Social Security number to every school she considered attending, and she now is on track to become the first person in her family to graduate from college. DACA has helped so many like Naomi and thousands of others who’ve been able to obtain higher-paying jobs to support their families, return to school, own a business, practice the career they studied and worked so hard for, and accomplish many other goals. But since Donald Trump became president, affected people’s and advocates’ DACA-related concerns have shifted dramatically. We’ve gone from working to safeguard DACA’s smooth implementation to fighting back efforts to discredit and dismantle the program. Although the president, when he first took office, stepped back from his campaign promise to repeal DACA—instead indicating that he has sympathy for “Dreamers”—the volatility of his administration and threats to the program made by ten conservative state attorneys general demonstrate clearly that we’ve got to continue to vigorously protect DACA. An end to DACA would not only be a devastating loss to those who currently enjoy its benefits, but also to the U.S. economy. The Center for American Progress (CAP) estimates that ending DACA would result in a loss of $460.3 billion from the national GDP over the next decade and would remove an estimated 685,000 workers from the nation’s economy. On the flip side, continuing DACA could increase the estimated yearly contribution of DACA recipients to state and local taxes, to $2.45 billion. But the main reason to protect DACA is that it would be inhumane to deprive hundreds of thousands of people from the freedom, opportunities, and goals they have had access to because of DACA’s benefits. At a time when nearly 8 in 10 voters, including almost three-quarters of Trump voters, support allowing “Dreamers” to stay in the country, it is important to emphasize that DACA is a policy that has safeguarded immigrant youth and that we still need a permanent solution. Whether because of political pressure or because their conscience is calling them to do the right thing, several members of Congress have announced bipartisan legislation to protect DACA-eligible people and others who arrived to the U.S. as minors. These new versions of the Dream Act and similar legislation proposing a path for some to regularize their status may seem promising, but while we wait for Congress and the president to come up with a clean, broad legislative solution, it is important we #DefendDACA and its beneficiaries. 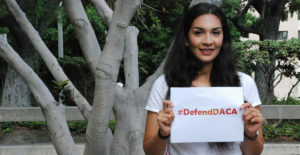 DACA taught me so much about the resilience and strength of the community I serve. I’m inspired by the heartfelt words of my former DACA client who said, “We’ve made it this far, and we’ll keep going. We just have to keep fighting.” We definitely must keep fighting—fighting without distractions and without fear. We must defend DACA until we have a real opportunity for permanent change. We must continue to support and stand in solidarity with our immigrant communities and be ready for the challenges to come. DACA was a win by and for the immigrant community. Let’s remember those lessons of strength as we forge ahead. This entry was posted in Uncategorized on August 14, 2017 by Richard Irwin.